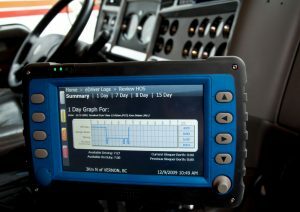 December 2018 is the first anniversary of the ELD mandate and – wow – have we learned a lot! Time to share!! I’ll get us started…. The ELD mandate came about as a way to better manage driver’s Hours of Service. But the technology has a much wider application and we wanted to utilize some of the information for IFTA and Weight Distance tax reporting. One way to help our truckers get more bang for their bucks. We investigated the marketplace of certified devices and made some recommendations for our truckers. Helping them get up and operating with the new technology taught us Lesson One. Nothing is as easy as it seems and we needed guidance and good information along the way. Working with the right people helped us overcome obstacles, fix problems and build a solid foundation for future operations. Next lesson – ELD hardware is NOT the same from vendor to vendor. Getting ELD’s set up, assigned to the right truck, turned on, and pinging successfully varies from vendor to vendor. Most importantly, an ELD needs to be set up so it can match up to a specific vehicle – sometimes the VIN is used, sometimes a truck number is used – just be sure the data will arrive with a matching vehicle ID number so it can be used easily. Otherwise distance, fuel, permits etc cannot come together and create a complete record for the vehicle. ELD vendors use different terminology and configure devices differently. So “begin with the end in mind” when doing the initial set-up of your ELD. And remember Lesson One – nothing is as easy as it seems and you need to work with people who understand your needs and the bigger picture. Next – the data has to be “output” for it to be useful. Every ELD vendor provides the information the device gathers in different ways. In addition to feedback from the physical device through a printer or your phone or tablet at roadside, you may be given a login to a website where there are many different reports – in many different formats. Some may deliver data by email. Some may offer an “API” Do you know how your ELD delivers data? Do you know what you need and what format it needs to be? Back to Lesson One – nothing is as easy as it seems and we need to help each other find our way. Time to welcome your additions to this conversation. Share with us and we’ll pass it around. And stay posted for what we have been learning as we use ELD data for IFTA and Weight Distance tax reporting! You will be amazed!! !